Firefighting is an arduous labor, incredibly demanding from both a physical and mental perspective. Firefighters do not get to choose the time and place in which their duties are to be carried out. Emergencies can occur at any time and in all manner of environments. The stresses and hazards that accompany their job like extreme heat or humidity create conditions that can have an adverse effect on the health and safety of these men and women. It is therefore crucial to see that emergency responders are provided with an adequate amount of rest and re-hydration, lest they jeopardize their own safety as well as that of others. A fatigued emergency responder will not be able to carry out their duties safely and effectively. Most fire departments are spread thin regarding personnel and resources. This means that they will often be shorthanded and not have the human resources available to effectively provide rehabilitation services while simultaneously handling an emergency. In these times they can turn to The Salvation Army Emergency Disaster Services for additional manpower to provide that needed rehabilitation, helping the firefighters immensely and reducing the risk involved in an emergency operation. To effectively coordinate with the fire departments and provide rehabilitation services, Salvation Army volunteers must undergo training. Last Saturday, Hanover Park Fire Chief Craig Haigh visited The Salvation Army Emergency Disaster Services in Elk Grove Village to provide fire ground rehab training for over 40 volunteers. 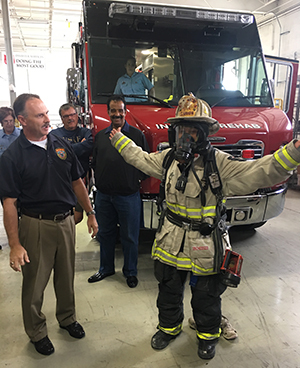 The full day training included a hands on tour of the Hanover Park Fire Department Incident Rehab Unit, a demonstration of an inflatable emergency shelter and the ability to try on Chief Haigh’s turnout gear and equipment. It was quite heavy! Chief Haigh recounted how over 10 years ago, The Salvation Army partnered with the University of Illinois to establish a rehabilitation services training program for Salvation Army emergency workers. The training featured a gamut of live-fire drills where the participants experienced the work of a firefighter under supervision from members of the fire department. This training method provided Salvation Army emergency workers a much more personal understanding of what firefighters go through, and therefore better prepared them to effectively provide assistance when needed. Chief Haigh reinforced, “training programs do not need to be as formal or as complex as the one developed … but providers do need to understand the importance of rehab, the technique of cooling, and the appropriate choices for fluids and foods.” Fun fact: firefighters do have a beloved rehab food – Smucker’s PB&J Uncrustables! In 2017, The Salvation Army Emergency Disaster Services responded to 52 disasters locally, supported 25,456 first responders and survivors and more than 600 families during the Lake and McHenry county floods. To learn more about The Salvation Army Emergency Disaster Services of Greater Chicagoland training and volunteer opportunities, visit salarmychicago.org/metroeds.